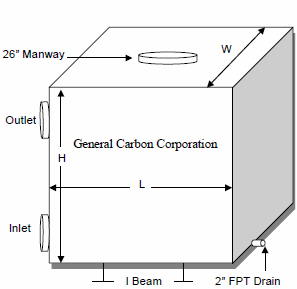 Activated Carbon Filtration | Vapor Boxes | General Carbon Corp.
General Carbon’s Vapor Box series of carbon adsorbers are versatile high airflow units. Each filter is easily transportable via the “l” beams support structure or lifting lugs. The large bed surface area in each model allows for the treatment of higher airflow rates. The Vapor Box adsorbers are constructed of mild steel and have two part epoxy coatings on the inside and industrial enamel on the outside to provide long service life. They are equipped with a manhole large enough for easy carbon changeouts. Several different grades of virgin and reactivated carbon are available to satisfy any of your filtration requirements. *Vapor Boxes are also available in stainless steel. Installation and Startup – The Vapor Box adsorbers require no special procedure for startup. Remove the shipping covers from the inlet and outlet and make the proper connections to your system. The unit is now ready for service and can be started up. Unions or quick-disconnect fittings are recommended if the unit will be disconnected frequently. Multiple units are usually connected in series with testing advised between the units to determine when the first unit needs to be changed-out. Maintenance – When in use, the Vapor Box requires no maintenance other than the monitoring of the influent and effluent liquid streams and the operating pressure of the system. Monitoring the air stream into the last unit in a series arrangement is a recommended safeguard against breakthrough in the final outflow. When the concentration of contaminants in the outflow equals the concentration in the inflow, the Vapor Box has reached its removal capacity and should be removed from service. The working life of each adsorber is dependent upon the type of contaminant in the water as well as its concentration and the air flow rate. A pressure relief device is advised to prevent damage to the canister in the event of excessive pressure buildup.